There's plenty to say about Glacier National Park, one of the most popular and scenic national parks — it is defined by glacial lakes, alpine valleys, vast green meadows and striking mountain tableaus. It is an idyll, with landscapes that might more often be found in a storybook. The vast park stretches over one million acres of northern Montana, and is home to multiple habitats and potential experiences for visitors. Based on our experiences with Glacier National Park thus far, we’ve synthesized our ideas, thoughts and suggestions to get you started in planning a Glacier adventure. Consider it a primer, as there is an abundance of information out there. Glacier National Park is actually a tricky park to get to, unless you happen to live in the upper Midwest or Rockies. The closest airport with regular service is in Kalispell, Montana, only a forty minute drive from the park gates. However, with this proximity comes higher fares. It’s not unheard of to see $500 or $600 round trip ticket costs to Kalispell in July and August, and rental car costs tend to be about $500 a week. With a shorter time to visit, this airport saves days of driving, and allows more time in the park. But there other alternatives. For one trip, we chose to fly into Missoula and drive two and a half hours to get to Glacier. The airfare was in the $300-$400 range, and cars could be had for $250 a week. We also chose Missoula for our gateway city because we could easily get saver and low-level awards tickets to that airport. Glacier is a great destination for using your frequent flyer miles for flights, as well. Flights to the Rockies and Upper Midwest can be hard on the wallet, but with enough planning they can often be found as saver awards tickets, worth two and three times more in value than, say, redeeming for trips to Orlando. Searching the awards calendar at the 330-day window can sometimes yield good results. In Missoula, we could also use our Hertz points for a free weekly car rental. Neither of those options was available for early July at Kalispell. The $800 we saved was worth the 5 hours of extra driving (and it’s a very scenic drive…you can buy the best cherries from family farms along Flathead Lake). Other options, if both Missoula and Kalispell are sold out on saver awards, are Butte, Helena, and Great Falls, all in Montana, and Spokane, Washington, though all are around 3-4 hour drive to Glacier. Assess your time and budgets to make a decision in your best interests. Mountain stream along the John's Lake Loop. Road tripping from further afield to get to Glacier provides the opportunity for a multiple park adventure; from the west, consider adding North Cascades and Mount Rainier National Parks to the itinerary. From the east, consider stopping at Yellowstone National Park and Badlands National Park. Baring Falls, on the Going-to-the-Sun Road. Summer wildflowers in the Two Medicine region. Another interesting choice is Amtrak, on the Empire Builder line. This popular route runs from Chicago to Seattle and has service that always stops at West Glacier, near the Apgar entrance to the park; Apgar is one of the larger family campgrounds and way stations for food and souvenirs, and has a scenic view of Lake McDonald. Canoes, paddleboards, and kayaks are available, as rentals. A second stop at East Glacier, near the less touristed Two Medicine entry, is offered from May to October. The Empire Builder is the most popular long distance train route that Amtrak runs, so do be sure to make plans early enough to avoid sold out trains. There is only one train per day in each direction. Amtrak times the schedule to offer you ample daylight to enjoy the mountains in and around Glacier National Park. Another awesome perk is the partnership with the National Park Service to provide an onboard ranger who points out historical and geological NPS sites of interest along the way. However, as it is Amtrak, they do utilize freight train rails and don’t have priority, and you may encounter delays along the way. These can extend the journey, sometimes by hours. If coming from Chicago, it’s a scheduled thirty-hour trip to West Glacier; if coming from Seattle, it’s sixteen hours (overnight). We found a car indispensable for our planned adventures, however, we could see planning a trip around the free shuttle service in the park, which traffics along the same road where you would use a car, with plenty of stops along the way. Certainly, some parts of the park are inaccessible without a vehicle, but a car is not 100% required for touring Glacier. Our advice, based on experience, is to utilize your airline miles, naturally looking for low-level award pricing, and to fly into Kalispell or Missoula. Pick up a rental car for the week and head on out! Note that often the rental car companies will attach a maximum number of “free” miles per rental before overage charges begin. While this hasn’t been frequent practice since the mid-nineties, be mindful, especially with rentals in the Rocky Mountains region. Once you’ve made it to Glacier, now where to stay? You have a variety of choices. The Village Inn, a Xanterra lodge on Lake McDonald. One of the most popular is camping. There are thirteen campsites that the NPS operates, with total park-wide camping spots totaling in the hundreds. Many sites take reservations, while others offer walkup availability. Reservations are encouraged in the peak months, however it’s rare that all campgrounds will fill, usually there is availability on the east side of the park. Check the official site recreation.gov for more details. Reservations often cost between $20-$25 night and the booking window opens up at 6 months. Popular sites can sell out within hours of going on sale, so for that July 4th trip, be ready to book in early February. Xanterra lodges inside the park, including the famous Many Glacier Hotel and Lake McDonald Lodge, are also popular options, and for good reason — they are scenic and old fashioned and cozy. You can find pricing and availability on their site, but most rooms are in the $200-$300 a night range. The company opens up inventory at around fourteen months, and it’s not unheard of for peak period bookings to sell out within hours of opening for booking. If looking to enjoy the historic lodges, be ready to book at least a year out to secure your room, to be on the safe side. There is also a chalet, the Granite Park, (with sad regrets, Granite Park’s sister chalet, the Sperry, burned down during a forest fire in 2017) though you will need to hike to reach the chalet. It’s not a rough hike, but you’ll need to allow at least 3 hours if you take a more scenic and the less strenuous route. Once there, meals can be arranged for additional cost. Note that showers are not available and toilets are of the rustic variety! However, this is an unmatched experience and a way to access a completely different historical experience of the park. Pricing is around $200 per night for one person. We’ve yet to do this, however, it’s going to be our choice method for our next trip to Glacier! 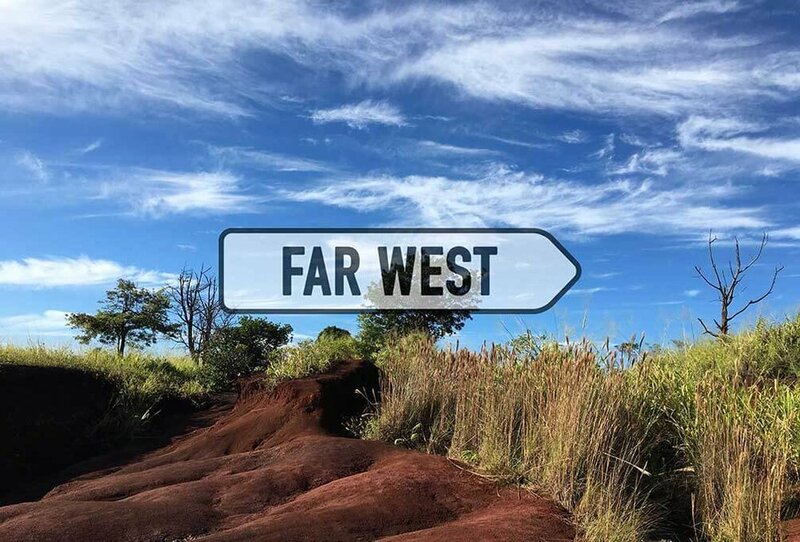 There are many accommodation options outside of the park, which is dotted around the edges with small and modest towns full of everything from 1 star to 4 star accommodations and several inviting B&B’s. If you are looking for major chain hotels for points redemption or accumulation, each chain maintains a presence in Kalispell. Depending on how far the hotel is from the park entry, you could be only looking at a 45-minute one-way commute. An early start will be necessary as the roads (and parking!) fill quickly inside Glacier. Utilizing hotel points can be an attractive option, as pricing on rooms tends to be in the $250-$300 a night range. Note that if you are staying on the east side of the park, there are few and far between chain hotels, the only one in reasonable range is a Holiday Inn in Browning, a 20 minute drive from the East Glacier entry. If heading to the northern reaches of the park, near the Canadian border (Glacier NP actually shares a border and operates in conjunction with Canada’s Waterton Lake National Park), options are more limited. There are no accommodations on the U.S. side north of the Many Glacier region, so you’ll either need to press on to the town of Waterton in Canada (home to the famous Prince of Wales hotel) or consider backcountry camping. St Mary Lake, looking west. Mountain views near St. Mary Falls. 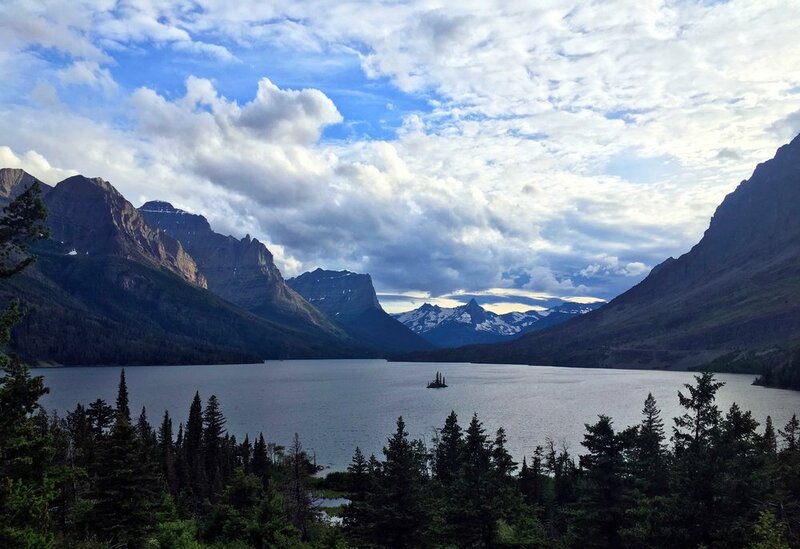 Entire guidebooks have been written about Glacier National Park, so rather than rewrite the same descriptive content, here are a few of our travel tips. It’s impossible to see everything in one visit. That said, we’d plan for at least one day in each region (Apgar [southwest], Logan Pass [central], St. Mary [east], Many Glacier [northeast], Two Medicine [southeast]) to get a feel for the park as an entirety. It’s no joke, this is bear country, so have bear spray with you at all times. We came within 500 feet of a mother grizzly and her cub hunting on a snow field in July. Bear spray is proven to be the most effective safeguard against bears. Some trails do have blind corners, so keep clapping and talking as you hike. You’ll see people with bells, this is really silly, they barely make any noise and you want the bear to hear you coming from several hundred feet away. Clap and talk with regularity. One solo hiker we saw was playing a podcast from a Bluetooth speaker as her bear warning. Beats talking to yourself out loud all day! Enjoying the peace and quiet as you hike in bear country is good way to get way too close to one. You can’t fly with bear spray in either carry or checked luggage and allegedly the TSA at Kalispell has a room full of confiscated aerosol canisters. It’s about $50 a bottle, and the lodges at Glacier all sell it; many B&B’s will loan or rent bear spray to their guests. The park shuttle system isn’t the greatest we’ve seen in the NPS system. If you’re expecting the regularity and precision of the Zion or Grand Canyon systems, think again. Glacier National Park is working on it, but the shuttles are very full and infrequent. The route is along the Going-to-the-Sun Road, from Apgar to St Mary. Note, the shuttles are not through routes along the Going-to-the-Sun Road, you’ll have to change buses at Logan Pass to get to the other side. The last bus of the day is often around seven, which can be a bummer if you want to linger for a later sunset, as it stays light in summer months until after nine. The famous red buses known as “jammers” are run by the Glacier Park Lodges. They’re worth a look for more regular transportation service and tours should you not wish to use your car or the shuttle system. 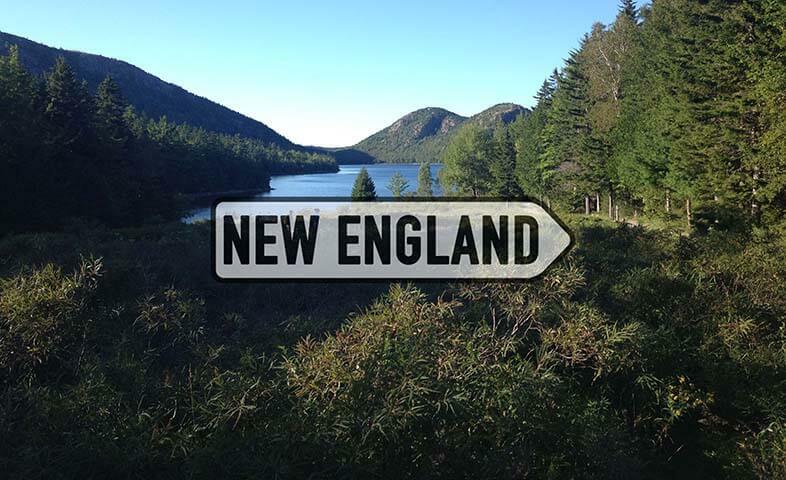 The rates vary based on distance, from $60-$100 per person. Xanterra also runs a paid shuttle system ($6-$10 one way) from the two train stations to various lodges in the park, so if arriving by train this is a great way to tie into the free NPS shuttle system. Lake McDonald lodge with old-school "jammer" parked in front. If you are interested in touring Logan Pass, an arrival before nine in the morning is strongly suggested to ensure a parking spot. If you aren’t up for an early morning, realistically you must take the free shuttle or elect to take a “jammer” tour that includes stops at Logan Pass. Lake McDonald, via the Apgar entrance on the west side of the park, is a great spot to ease into the elevation with some good level hikes, like John’s Lake loop and Trail of the Cedars. You’ll share the trails with lots of fellow adventurers. If looking for a bit more of a challenge, Avalanche Lake is popular, but for good reason, the view is stunning and it’s only a moderately difficult trail, about 4.5 miles roundtrip. Escape the crowds by making sure to visit both the Two Medicine and Many Glacier regions of the park. Both offer a picturesque glimpses of mountains, glacial lakes, beds of wildflowers and rugged terrain. There are plenty of adventurous hikes in the Many Glacier region as well as opportunities to for boat trips. If hiking to Grinnell Glacier, don’t forget to book the boat across Swiftcurrent Lake and Lake Josephine, it’s going to save you several hours of hiking and you’ll want your energy for the trail to the glacier. The NPS runs a free day-long ranger guided hike to the glacier in late July and all of August.The Swiftcurrent Nature trail, just outside of the Many Glacier lodge, is a lovely loop around Swiftcurrent Lake and, on clear days, views of the towering mountains above are marvelous. If you want to escape the Grinnell Glacier crowd, consider Ptarmigan Falls trail, a gently sloping up climb with a level throughway for much of the hike — it’s moderate and has great views of the valleys and mountains. You might even see the ptarmigans flitting about the cliffs. Consider heading further on that trail to Iceberg Lake if you are interested in a full day long moderate hike. If wanting to get some altitude, head to the famous Ptarmigan Tunnel (a 250- foot long pedestrian tunnel cut through the mountain). At Two Medicine, the boat tour of the lake also provides a relaxing way to enjoy the changing scenery. Prices are around $13 per person. From our drive along Camas Road. Camas Road, located north of the Apgar entry, is a good place to take a scenic drive without the bumper to bumper traffic. It is also the best bet for seeing wildlife from the car. The drive heads away from the main roads and is a paved road that leads to the Flathead National Forest. Along the way, there are plenty of pull outs and interpretive stops with opportunities to rest and take in the scenery and mountain air without the din and hustle of the main park roads. Bowman and Kintla lakes on the northwest side of the park are worth consideration in your planning as they’re classic glacial lakes, with amazing views and minimal amounts of park visitors. You probably don’t have time for both and we’d vote for driving the extra half hour to Kintla over Bowman. Though the park is called Glacier, actually seeing more than one other than from Jackson Glacier overlook on the Going-to-the-Sun-Road is tough. You can hike to Grinnell Glacier from the Many Glacier side of the park, though it’s a full day long hike. If you want more accessible glaciers and more to visit, look a bit further west to North Cascades National Park. Check with rangers about the nighttime programs, there’s an NPS astronomy unit that sets up telescopes near the Apgar visitor center on summer evenings. The 50 mile long Going-to-the-Sun Road, which winds though the majestic Rocky Mountains and over the Continental Divide, is a spectacular drive. However, plan ahead. It’s not unheard of for the road to still not be fully plowed and open until after July 4th and it’s usually closed for the season by snowfalls in late October. There are a multitude of free ranger led hikes and talks, make sure to consult the monthly brochures available at the entrance stations, visitor centers, and online for up-to-date information.